« Make Me An Offer Monday! 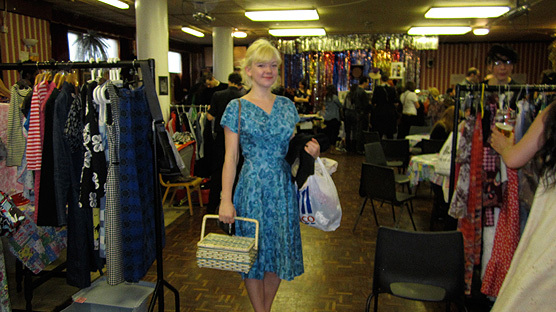 When the Wills-Moody jumble in St Aloysius Social Club in Euston started 6 years ago it sparked a new wave of jumble sale across London town. Xtina from Printed Wonders in full on mourning dress code along with flocked tear drop. In my world a jumble sale is run by grannies in aid of charity, stuff is sold for about 20p and they’re really very hit and miss. Much like a car boot sale or charity shop – no pre-sorting has occurred so you could spend hours searching for gems with no guarantees. Once upon a time the only place you could go, to guarantee finding ace stuff was a ‘vintage’ fair or shop but you’d pay through the nose for the privilege. 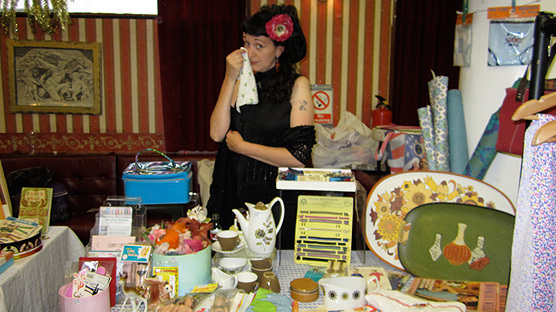 Naomi Thompson from Vintage Secret at the Rock’n’Roll Jumble Sale. Six years ago Karoline and Emma launched a new wave of jumble sale that filled the gap in the market for a place you could seek out affordable and great second hand swag. 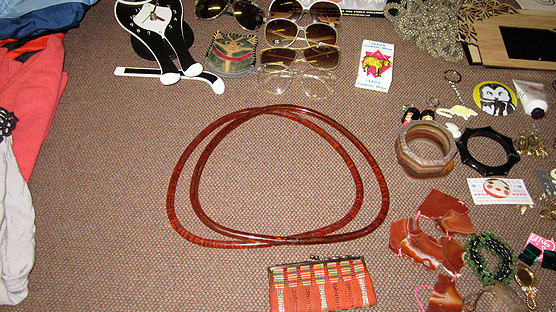 Stallholders were designers, artists, collectors and the like who were spring cleaning their pad and selling on unwanted bits’n’bobs. I’ve attended many of the Rock’n’Roll jumbles through the years and have happily watched the trend spread across the capital. Bravo. 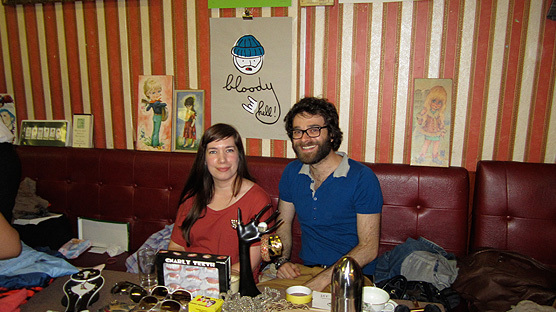 Unfortunately, last Sunday was the last ever Rock’n’Roll Jumble Sale held at it’s original venue. The girls have said they might move to another place and I’ll keep you updated if they do. Until then there are many other new wave jumbles about town including Can’t Buy Me Love, New Gallery Jumble and checkout this great Facebook page which lists a whole load more. A pair of vintage glitter bag handles for my next crafting adventure. My favourite find from Sunday were these amazing huge glitter bag handles which I’m going to make a giant tote bag with which I’ll screen print at a Gocco workshop I’m going to next week. I’ll be sure to show you the finished result. Such beautiful and inspiring vintage vignettes, they’re all giving me ideas on how to stage my wares. Hmmm! This looks amazing! Sad it’s gone before I get a chance to check it out. I don’t get to London often. I buy and sell at a lot of vintage fairs though and I find the prices really very reasonable, about the same as the prices on Thrift Ola for homewares and cheaper than most vintage shops for clothes. Not jumble sale cheap, but then the stuff is great quality so that is to be expected.I was wondering which ones you ‘pay through the nose’ at? Because http://www.thevintagefair.com and Judy’s Affordable Vintage Fairs and lots of others are really well priced and worth checking out. And all over the country! it was a fantastic finale and I felt so honoured to be there. Let’s hope they find a new suitable venue and the event can reincarnate giving us bargains and wonderment galore some more! PS I bought that funky Italian tray and some cool funky fabrics from Printed Wonders! Wasn’t it just. I had such a fun day and spent every single penny in my purse within about 20 minutes! Will miss it terribly.